Small crossovers are now more popular than ever before. If you’re in the market for a small crossover, the new 2019 Jeep Cherokee is bound to leave you impressed. It’s spacious, versatile, and fun to drive. Updated exterior styling makes the refreshed 2019 model even more exciting. As always, your local Jeep dealer serving Boulder Longmont Fort Collins offers a long list of great features. Let’s see which SUV comes out ahead in this 2019 Jeep Cherokee vs 2018 Kia Sportage comparison. If you’re looking to stand out from the crowd, the new 2019 Jeep Cherokee is the clear winner. The 2018 Kia Sportage doesn’t demand nearly as much attention on the street. For the 2019 model year, Jeep gave it a few styling updates. Jeep fans will love the Cherokee’s new LED headlights. 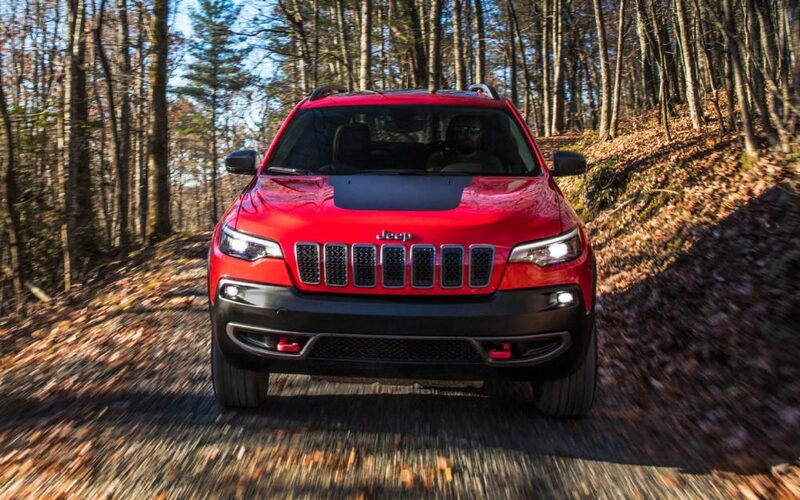 A refreshed grille further enhances the Cherokee’s powerful road presence. Sleeker rear-end styling makes this crossover look even more stunning. Even the base model will turn a lot of heads. Some of the eye-catching paint colors include Velvet Read Pearl, Granite Crystal Metallic, Firecracker Red, and Olive Great Pearl. Each Cherokee model has its own unique look. A beautiful set of 19-inch polished wheels and chrome tow hooks are featured on the range-topping Overland model. To see all of the exciting Cherokee trims, visit your local Jeep dealer serving Boulder Longmont Fort Collins. Like most drivers in Boulder Colorado, you probably need to accommodate your family and friends. While both SUVs are designed to seat up to five people, the Cherokee gives your passengers more space to stretch out. When comparing the Cherokee vs the Sportage, you’ll immediately notice the Cherokee’s more spacious backseat. Passengers will enjoy an additional 2.1 inches of legroom. Big families will definitely appreciate the extra room. The Cherokee also benefits from a more accessible cargo area. From travel bags to hiking gear, you’ll be able to easily load stuff in the back of the Cherokee. A power tailgate is available on certain trims. Both SUVs come standard with an efficient four-cylinder engine. However, a nine-speed automatic transmission helps the Cherokee to deliver a more responsive performance on the road. If you desire more power, Pollard Jeep gives you two other engines to choose. While the Pentastar V-6 engine develops 271 horsepower, the all-new new turbocharged four-cylinder develops 270 horsepower and a crushing 295 pound-feet of torque. Even the Sportage’s most powerful engine only develops 240 horsepower. When hauling around a full load of passengers and cargo, you’ll certainly appreciate the Sportage’s extra muscle under the hood. The 2019 Jeep Cherokee is also more suitable for towing big loads. Rated to tow a class-leading 4,500 pounds, the Cherokee can easily pull trailers and campers. A 2,000-pound maximum towing capacity puts the Sportage at a big disadvantage. Jeep is well-known for its ability to build extremely rugged SUVs. When it comes to tackling rough terrain, the Trail Rated Jeep Cherokee remains one of the most capable crossovers in Boulder Colorado. It’s a perfect match for the adventure seekers who love to travel off the beaten path. While the 2018 Kia Sportage can be equipped with all-wheel drive, it’s not built to handle rough environments. It fails to offer important off-road goodies such as all-terrain tires and protective skid plates. 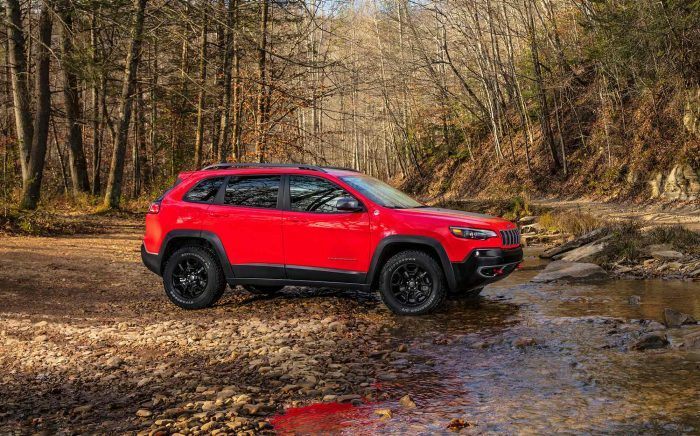 For the drivers who need an extra degree of toughness, Jeep offers the Cherokee Trailhawk. It comes equipped with a special Active Drive II AWD system, which gives you the maximum traction on slippery surfaces. 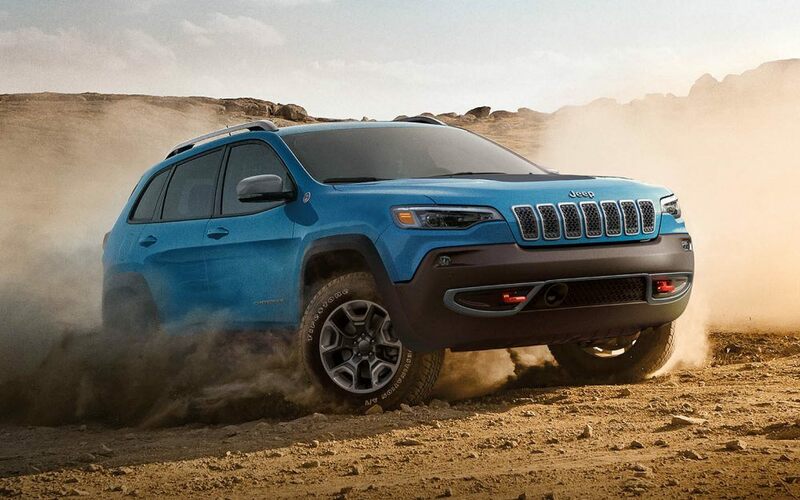 A raised suspension also helps the Cherokee Trailhawk to topple off-road obstacles. Some of the other rugged upgrades found on the Trailhawk model include tow hooks, underbody skid plates, and hill descent control. Upon taking a look at the new Cherokee vs the competition, it’s easy to see why the Cherokee comes out on top. It’s among the best values in the segment. A long list of great features comes standard. Some of the highlights include a a 7.0-inch touch screen, Bluetooth, and a backup camera. Not only does the 2018 Kia Sportage’s standard infotainment system feature a much smaller 5.0-inch display, but it also fails to provide Apple CarPlay and Android Auto smartphone integration. As you climb the trim ladder, the new Jeep Cherokee takes another leap past the Sportage. 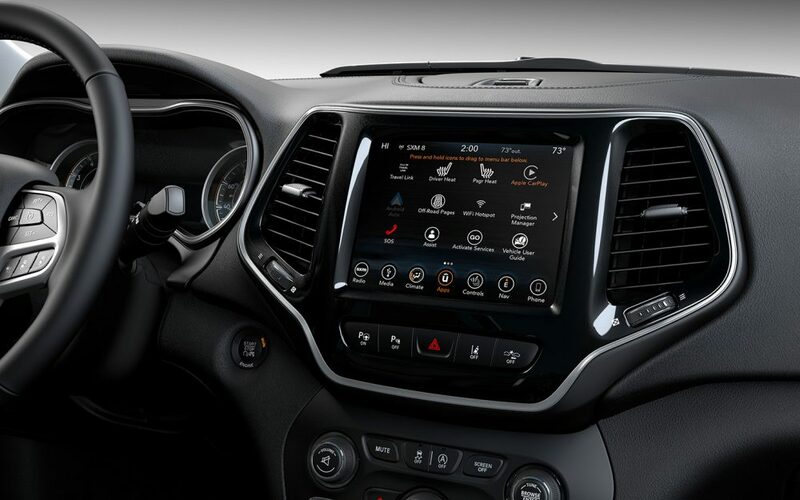 An available 8.4-inch touch screen makes the Cherokee feel especially luxurious on the inside. Perforated leather isn’t even avaialble on the Kia Sportage. Automatic parking is yet another feature not offered on the Sportage. The Cherokee’s automated parking makes it far easier to maneuver in tight spots. You can trust the new Jeep Cherokee to keep your family protected. It provides superior impact protection from every angle. You also have access to a number of advanced driving aids. While blind-spot monitoring helps you to detect oncoming vehicles on the highway, automatic emergency braking can bring you to a stop during panic situations. Among the Sportage’s drawbacks is its failure to offer adaptive cruise control. Stop and Go technology enables Jeep’s adaptive cruise control system to automatically detect slower traffic ahead. As you can see in this 2019 Jeep Cherokee vs 2018 Kia Sportage comparison, the Cherokee has trampled the competition. Contact Pollard Jeep to schedule a test drive!